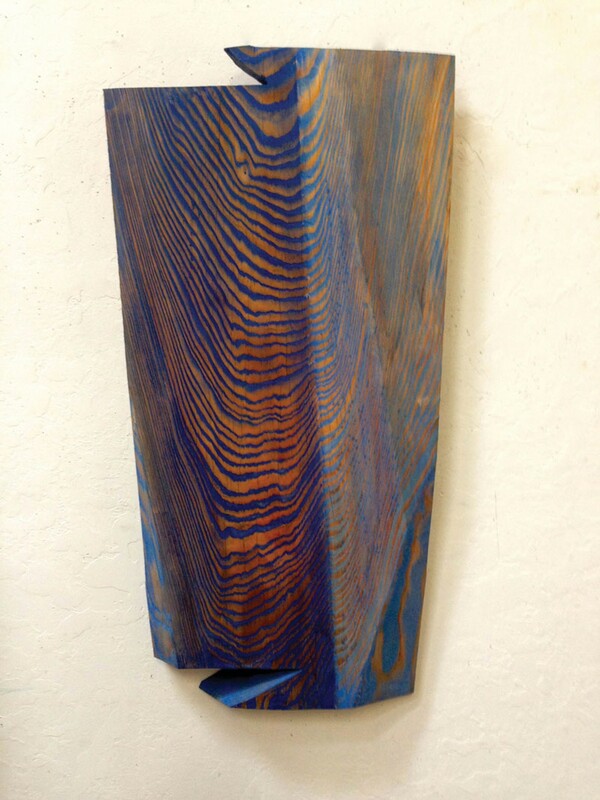 Benson's "Current 2" features trompe l'oeil woodgrain that's a study in waves. Bob Benson is showing paintings, painted and carved wall panels, and freestanding sculpture this month at Piante Gallery. Benson, a member of the Tsnungwe Tribe who sits on its Elders Council, served as a professor of art at College of the Redwoods for several decades and is now emeritus. He has exhibited extensively, both nationally and in his native northern California. Benson's art addresses nature, often by shaping regionally specific materials into forms that recall natural phenomena. Like much of Benson's previous work, the paintings and sculptures here feature simple, iconic forms derived from nature and traditional Native American culture. In his statement for this exhibition, Benson says that the current works explore his longstanding interest in wave patterns. "Wave forms fascinate me," Benson writes. "They are time, movement, energy, light, sound, and seem to exist in everything." Benson has worked with these natural forms before, for example in the public sculpture "River Steps," a massive redwood carving installed at Arcata's Giuntoli Lane roundabout in 2010. The undulating form derived from the wavelike features Benson observed in redwood grain and water. His new work develops this longstanding preoccupation in unexpected and engaging ways. As an artist with a feel for waves, it turns out Benson's in good company. The list is not a long one, but it's full of surprises: Hokusai, Gustave Courbet, Hiroshi Sugimoto and Mariko Mori — as well as every surfer who's ever painted, not to mention experimental filmmaker Michael Snow, who directed Wavelength (1967), probably the definitive moving-media statement on the subject. Like those artists' works, the pieces in this show expand our mind by inviting us to think about the familiar forms of waves in unfamiliar ways. Three artworks from the show offer three very different meditations on waves. 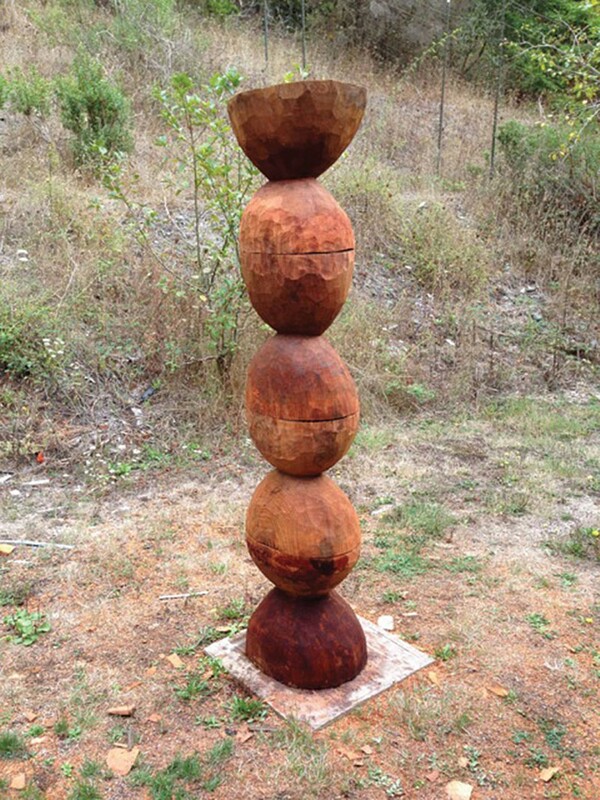 The 6-foot-tall vertical wooden sculpture is titled "Stacked Stools," but it's also more than the sum of its parts. What we have here is four stools superimposed: almost identical, hand-carved wooden units of like size, shaped like barbells or hourglasses, bearing the marks of the sculptor's chisel. Superimposed this way, the four units merge into a continuous vertical form — an elongated shape that is too predictable to read easily as organic and yet not quite regular enough to be geometric. It seems like it could be, hypothetically speaking, eternally prolonged. The shape contracts and flares rhythmically, like peristalsis; it is attenuated, yet grossly physical in terms of the way it bulges against constraint. So the form's quite dynamic, and I haven't even yet mentioned the sly riff the piece enacts on modernist sculptor Constantin Brancusi's 1918 "Endless Column." Brancusi's first version of the "Endless Column," hand-carved in oak, also featured a formal unit repeated vertically four times. Brancusi's forms are hard-edged and geometrically exact — pairs of sectioned pyramids, stuck together at their bases, which come together to create the impression of an unbroken chain that is apparently repeatable ad infinitum. In contrast, Benson's forms are animated by slight irregularities that make it possible to distinguish one unit from the next, even though the stack as a whole retains a modular look. Brancusi's sculpture did away with the traditional pedestal, effectively incorporating the base. Later, art historians would interpret this as progress toward modernist autonomy. The argument goes like this: When it took over the pedestal, "Endless Column" became completely self-contained; it was modular and nomadic, like a spaceship or a Buckminster Fuller geodesic dome, capable of picking up and setting down anywhere, indifferent to location, simultaneously at home everywhere and nowhere in this world. The shift paralleled modernist art's retreat from political and social concerns. It seems right that Benson should borrow Brancusi's form and bring it down from the modernist ether, reinvesting it with organic quirks. Benson's column bears the unvarnished title "Stacked Stools"; it's not making any promises about endlessness, which is a dicey proposition in a world of limited resources anyway. While Brancusi's work transcends location, Benson's is carved from local wood. Besides, Benson's sculpture has practical utility: It even says so in the title. You could, in theory, take the work of art apart and use each of its parts for the undeniably basic task of sitting. Modernist theories of sculpture promoted the idea that the sculptural object should possess integral cohesion; Benson presents the artwork as a Voltron-like conglomerate, a linked strand of collaborative forms rather than an indissoluble whole. "Current 2" poses a suave challenge to viewers' trompe l'oeil skills in the form of a sleek, wall-mounted wooden panel, the luscious grain of which turns out to be not integral to the wooden support but painted on. Like all paintings that successfully "fool the eye," "Current 2" has a hard, satiric edge. So, you really think you can reliably distinguish between art and nature? it seems to inquire. If you answered in the affirmative, prepare to have your pretensions undermined. The acrylic monoprint "Flints 2" fills the page with a pattern of wood surfaces in muted, desaturated tones, then illuminates that field by blazing a narrow band of vivid color across its middle. The narrow colored zone features a bold abstract design of chevrons and parallel red bands. The vivid color fades at the margins, as though the picture's pale, washed-out ground had been the product of literal erasure. It's easy to see how Benson derives some of this imagery from indigenous motifs like the flints referenced in the title, creating a hybrid visual vocabulary that recalls the geometric forms of traditional Native American art without precisely duplicating them. Bob Benson: New Work shows at Piante Gallery Oct. 2 through Oct. 31 with an opening reception during Arts Alive on Oct. 3.